There is nothing better than climbing into a beautiful and well-made bed at the end of the day. I know that the reality is that it doesn’t happen as much as we would like it to. Mornings can feel like a race against the clock, so making the bed before leaving the house might be the last thing you’re thinking about. Or, another reason can be that maybe some of us don’t know HOW to make our beds look like those beds you see in a catalog. BUT, I kinda feel like you want to… am I right? Here, you’re going to learn how to make your bed look like the beds in a magazine by following a few simple steps. I have made many beds and spent countless hours studying catalogs to bring you this information! So use it, save it, pin it, do whatever you need to do to save this information for future reference. 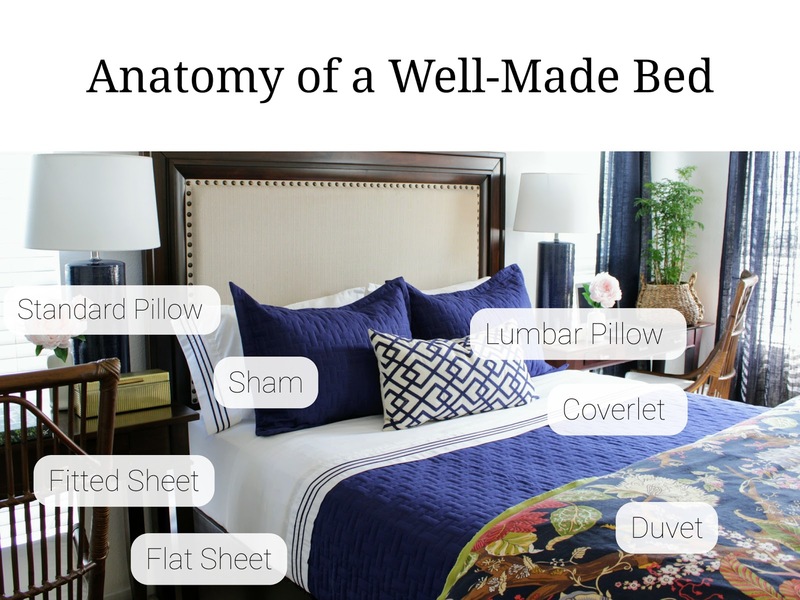 Let’s talk about what you need to make your bed look gorgeous. I’ll give you the list, plus some details about each item. Fitted sheet - This sheet usually has the elastic around it. You know, the one that’s impossible to fold. Flat sheet - Just the regular sheet that you cover yourself with. Keeps you cool at night. Coverlet - You might be thinking “What the hell is that?” OK, a coverlet is pretty much a quilt. Many people use it as a bedspread. It can have a pattern or be solid. It provides a thin layer of warmth and it goes over the blanket. Most people don’t use a coverlet but I think having one really elevates the look of your bed. Duvet - This is the big, puffy thing that goes on top of all the layers of the bed. It comes in a variety of colors and patterns. It can also come plain white, which is meant to be inside a duvet cover. It provides maximum warmth. Duvet cover - A decorative cover that would go over a duvet insert. Like a giant pillow case for a duvet. Pillows - You need at least 4 standard pillows for beds excluding twin beds. Twin beds can get two. Pillowcases - These cover your pillow. Shams - These are pillow cases with a decorative edge all around. There’s also “Euro Shams” which are square instead of rectangular. If you need help coordinating your bedding, let me give you some advice. I say, start with your duvet. Use the colors on your duvet as a guide. I like to take the dominant color from the duvet and use that to choose my color for the coverlet and sometimes shams. I like plain white sheets, but you can take an accent color from the duvet and play that out with sheets, borders and decorative pillows. Now that you know what you need, it’s time to make the bed. Step 1 - Place your fitted sheet on your bed and smooth it out. Make sure you tuck that sheet in as far as you can so it stays in place. Step 2 - Add your flat sheet. Make sure it is right-side down. Same if you have a patterned sheet. The pattern goes down, facing the fitted sheet. This is because you will turn the edge over and you want to see the finished seam (or pattern) exposed. It’s the little things, yo! *Speaking of little things, have you ever slipped into a bed with ironed sheets? It’s amazing. I say give it a try! OK, for the record I don’t always iron my sheets. Usually I do when either company is coming or I’m feeling fancy. But before you start rolling your eyes, let me tell you IT MAKES A HUGE DIFFERENCE slipping into pressed sheets! They feel so smooth against your skin! But, save that for special treats every now and then. We don’t want to be ironing sheets every day. Too much. If you have company coming and you want to show off your crisp bed, then just iron the edge of the sheet that will be seen! I totally do that! Step 3 - Add the blanket and pull all the way to the seam of the flat sheet. Step 5 - Tuck everything under the mattress, starting at the foot of the bed, making hospital corners. Kind of like folding a present. Step 6 - Turn the top edge over the coverlet to reveal the sheet. This adds layers and contrast. It also makes it easier to snuggle inside the bed. Step 7 - For that extra luxury, add a puffy duvet at the foot of the bed and fold into thirds with the finished edge going towards the head of the bed. Step 8 - Add the pillows you use to rest your sleepy little head. You know, the ones you drool on. Step 9 - Hide the drool stained pillows with pretty pillows covered in shams. Step 10 - Add your decorative pillows and you're done! I just added one but feel free to go cray. See anything you like? I have most of the items or similar items in this bedroom linked below the following picture. Click on the product descriptions below for more info. If you have all the necessary “ingredients” and follow this “recipe” that I gave you, TRUST that your bed will look amazing! And not only will it look amazing, it will feel amazing to slip into at the end of the day. 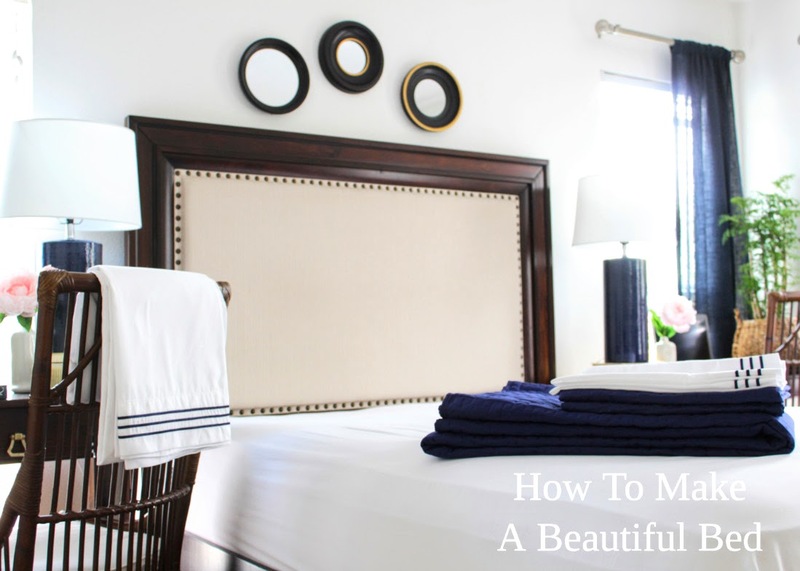 Go ahead and follow these steps and make your bedroom look great. You deserve it! You’ll even feel better about yourself! Did I leave anything out? Please let me know what questions you have about making a bed or any bedroom related decor questions and I can do a follow-up post! If you want more tips on organization then click HERE. I even have a Cleaning Schedule that I swear by AND tips on getting your kids to make their beds! Thanks so much for reading along. I sincerely hope this information was valuable to you and you enjoyed it!